We don't know about you, but when we go fishing all we want to worry about is if the next fish we hook will be bigger than a minivan. Fishing is as zen a sport as there is, one that brings us physically, emotionally, and spiritually closer to nature than most others. So when you're booking a vacation dedicated to fishing, you want as little hassle as possible, right? Of course we're right. We've assembled the best fishing resorts in the best place to fish (Alaska), and each will handle the minutia so you can devote body and soul to asserting your authority over halibut, salmon, and the like. The friendly and knowledgeable staff of Alaska's Gold Creek Lodge can help even the least skilled fishermen land the big one! Approximately 280 miles from Anchorage, and nestled snugly within the Bristol Bay watershed, Alaska's Gold Creek Lodge is also perched on the banks of the world-famous Naknek River. That gives it unfettered access to the superb fishing the area is known for! You can expect extreme personal attention and hospitality, as there are at most 14 guests on the property at any one time. If you don't want to bother with mapping out your day to day, you'll love the lodge's "Ultimate Fly-Out Package", perfect for those who want to experience it all. You'll hop on a float plane and head out to the southwestern peninsula., where you'll find more natural splendor and teeming shoals than you can shake a rod at! King Salmon is service and shipment center for the commercial red salmon and sport fishing industries. Who'd have thunk?! Jimmie Jack himself invites you and everyone you know to come experience fishing as it was meant to be- surrounded by Mother Nature's glory! With its collection of boats, gear, and captains, it's supremely simple to get here, get out, and get the big one! Once you're out there, you'll be fishing for Kenai River king salmon, Kasilof River king salmon, Sockeye Salmon, and Silver Salmon (among others). Add in incredible hospitality, prepared breakfast, lunch, and fine-dining in the evening, complimentary wine, drinks, and appetizers, and a spectacular beachfront location and you have a destination that should be at the top of any angler's list! Northwoods Lodge describes itself as "the premier Alaska Fishing Lodge located on Fish Lakes Creek". It's the best- why would you settle for anything less? Just a scant three miles from Lake Creek, Northwoods lodge manages to feel secluded yet sociable. The sociable part starts right when you arrive, as you'll be immediately greeted by your fishing guide, who will remain with you throughout your stay at Northwoods Fishing Lodge. Seven Alaska creeks are within boating distance of the fishing lodge, each offerings its own charms, nuances, and sights. Don't worry about hauling all your fishing stuff- the lodge is happy to provide excellent equipment for all anglers, even those looking to try their hands at fly fishing. From the river bank, back trolling, or mid-stream shallow areas you'll cast away, reel it slowly, then cast away again. It's a little slice of heaven. The Yentna River is a glacial fed tributary of the Susitna River that provides clear water tributaries to sight fish. Lake Creek is 60 miles long running North to South from Chelatna Lake in the Alaska Mountain Range to the Yentna River. What more needs to be said? Salmon Catcher Lodge will do exactly what you'd think it would do- show you where and how to reel in a big pink Salmon! As one of the Kenai Peninsula’s premier fishing lodges, guest's expectations of Salmon Catcher Lodge are typically sky high coming in. Time and time again, the Lodge shows them an unforgettable experience! Stay in the finest handcrafted spruce log cabins, each tastefully decorated to embrace Alaska’s great outdoors. Meanwhile, the lodge's fishing guides can guide you to some of the best Salmon hotspots in all the great state of Alaska! There is a free airport or train station shuttle. Alaska Rainbow Lodge has easy access to more than 3,000 square miles of the Iliamna-Katmai watershed at its beck and call. Just step outside your gorgeous accommodations and get to it! While all types of fishing are excellent here, Rainbow Lodge truly excels at the timeless art of fly fishing. River fishing is plentiful here, with more than 30 different rivers and streams in the area, most of which feature world-class Rainbow Trout, Arctic Char, Silver Salmon, King Salmon, Sockeye Salmon, and Grayling. The Lodge also flies out daily with multiple aircraft, if you're trying to get REALLY remote. Meanwhile, it's a load off your mind that you'll be returning to luxury lodging and world-class dining at Alaska Rainbow Lodge! After you catch the big one, put your mind at ease! The Lodge can take care of all packaging, vacuum sealing, smoking of your salmon! You'll then take it home in airline-approved, wet-lock boxes. The Lodge is still under its original owner, who has more than 50 years experience! For freshwater salmon fishing, there is a simple rule: the closer you are to the ocean, the fresher the fish, and the better the fishing. The Alagnak Lodge is just five miles inland, plus it's in a city called King Salmon. It's gotta be pretty good! The tidal water on the lodge's doorstep is, simply put, the best place to fish for salmon. Of course if you seek a little more seclusion, flyouts give you the opportunity to explore the excellent trout, grayling and char fisheries in Katmai National Park and the surrounding area. Don't worry yourself about planning the details, as for simplicity's sake each day on the Alagnak is divided into three sessions. Your guide will take you out any two of the three sessions, and fishing is available right off the dock or nearby at other times. The five species of salmon add a lot of variety to the fishery. King salmon prefer to stay in the deeper water, and most of the king fishing takes place from the boat using a variety of techniques and either gear or fly. Pacific salmon stop feeding when they enter fresh water, and face a journey upriver that will gradually deplete their energy reserves. The serenity of the north shore of Summit Lake and superior Alaskan hospitality can be experienced in full at Summit Lake Lodge! The all-inclusive fishing package at Summit Lake includes a four nights stay and three tours of some of the best fishing in the world. You'll take a fly-out trip and enjoy bear viewing and salmon fishing to your heart's content, Afterwards, spend a full day of fishing in a drift boat on the Upper Kenai River, and then a full day halibut fishing out of Resurrection Bay. This package is perfect for any occasion and group- families, couples, and friends will have an experience they'll never forget! The large slate fireplace and rustic bar offer a place to have a conversation and relax. Start your day with a complimentary delicious breakfast then choose from the many activities in the area. Let us hit you with some facts: Deep Creek Fishing Club is a deluxe ocean-front lodging featuring panoramic views of five surrounding glacier-capped volcanoes. Also there is some decent fishing. Do we have your attention yet? All rooms come with king-size beds, a rock fireplace, private bathroom en suite, satellite TV, mini fridge stocked with complimentary soft drinks and daily maid service. 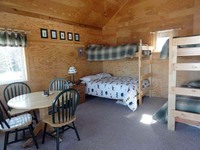 Of course, you'll only spend your nights in your room- the rest will be filled with fishing, fishing, and more fishing! Fully guided saltwater or fresh water fishing, four guests to a boat so you know you'll be getting incredible personal service. Also you can stop fretting about meals- your stay comes with a complete dining plan, with hearty breakfasts, lunches and 5-star gourmet dinners with complimentary wine and beer! Photograph the giant Brown bear up close and personal, feeding on salmon or sedge grass. Deep Creek Fishing Club is the only operator which uses helicopters to take you to non-commercial bear viewing areas; in other words, the REAL Alaska. Deep Creek is the only lodge to fly into these particular spots! It is not unusual to see 30-50 bears in a day. Book your next fishing trip with Kenai River Drifter's Lodge and experience some of the most dynamic and productive fishing to be found. Within driving distance of the famed Kenai Fjords National Park and Cook Inlet halibut fishing, Kenai River Drifter's Lodge puts you in the middle of some of the best trout and salmon fishing waters in the world. The lodge caters to all ages and levels of experience, providing the trip and guide that is right for you. The staff and fishing guides at Drifter's Lodge specialize in providing an experience of a lifetime to all their guests, making it the perfect place for your next getaway. Drifters Lodge has 12 different accommodations ranging from self-contained, private cabins to individual rooms in the lodge with amenities. Drifter’s Lodge offers three different rafting trip options on the Kenai River suitable for all ages. Originally established as a wilderness lodge in 1989, Zachar Bay Lodge continues to welcome travelers of all kinds to its unforgettable Alaska destination. Located on beautiful Kodiak Island, Zachar Bay Lodge lets you take a break from the concrete jungles of the cities and simply indulge in great outdoor adventures as well as true relaxation in a refreshing environment. Zachar Bay Lodge takes the stress out of planning your Alaska adventure with an all-inclusive experience. Whether you're a fan of fishing, hunting, or just looking to getaway from the cities, you will discover this refreshing Kodiak Island retreat to have everything you need. Comfortable lodging, delicious meals everyday, and safe, guided trips in the area that will keep you busy are included in your stay! Fishing enthusiasts of all skill levels will delight in the opportunities that await at Zachar Bay Lodge. Both freshwater and saltwater trips are available here, complete with a professional guide and quality equipment to ensure you're prepared for a safe adventure. Cast your line for everything from halibut to silver and king salmon! Surrounded by the Kodiak National Wildlife Refuge, which protects the population of brown bears and other wildlife, the lodge offers guided trips through the wilderness to catch sight of its many inhabitants. You'll stop at Frazer Falls, a popular spot with a high concentrations of wild brown bears where you're sure to see a few salmon in the water! The incredible Kodiak Island is a treasure trove for hunters. At Zachar Bay Lodge, you can experience some of the best hunting for sitka blacktail deer in the area. With the surrounding Kodiak National Wildlife Refuge all around, this is the perfect place for a hunting adventure. A trip to Angry Eagle Lodge & Outfitters is a nonverbal way of saying "I'm ready for an unforgettable experience". Once you arrive, kick back and allow Angry Eagle's divine packages give you the total experience! What do you get when you combine three decades of experience, gorgeous natural surroundings, and exquisite fishing? Great Alaska Adventures, of course! 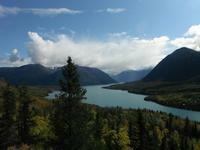 Explore the Kenai Peninsula whilst plumbing its depths to your heart's content! 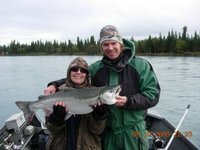 Great Alaska Adventures top-notch staff and facilities will make your trip an unforgettable one. The surrounding waters are home to more than two dozen target fish species, including Kenai river King salmon, Kasilof river King salmon, Kenai River Sockeye Salmon, Kenai River Silver Salmon and Kenai River Pink salmon, Long story short: if you're a fan of Salmon, you'll be a fan of Great Alaska Adventures! Great Alaska Adventures offers independent 2-5 day stays plus overnights are included in many of the amazing 5-7 day Alaska Adventures. Since 2010, Great Alaska Adventures has been certified as a sustainable Travel Destination from Adventure Green Alaska!